Browsing the WordCamp Central website to see where the next WordCamps are going to be held is always exciting for a geography nerd like me. Despite spending a significant part of my childhood with maps and atlases, reading about upcoming WordCamps always makes me discover tiny, quaint towns I have never heard of before. But when it comes to Europe, I was pretty sure it was safe to say I knew a thing or two about every city that hosts a WordCamp. Until I found out about WordCamp Norrköping, Sweden. Wait, Norr… What? Norrköping, nicknamed as Sweden’s Manchester due to its thriving industrial district, is a nice and chilled town 100 miles south of Stockholm. Fun fact about Norrköping—it’s pronounced somewhat like Norr-sho-pin. Luckily enough, I had every point of interest at a comfortable walking distance: train/bus station where I arrived, the hostel where I stayed, WordCamp and Contribution Day venues, restaurants… I never had to jump in a bus or taxi. And I’ve literally loved that: oftentimes, especially in big and over-globalised cities, fitting some sightseeing time into WordCamps’ tight schedules is simply not feasible. Getting around Norrköping often means strolling around the Strömmen, the river that flows through the town and once powered the textile factories; and walking along the river offers the best views over the city. I’m fairly confident Norrköping’s atmosphere reflected a Swedish vibe, but don’t take my word for it—as for many other non-Swedish people, my gateway drug into the Swedish culture was only IKEA! Goes without saying, the Swedish are extremely kind, friendly and hospitable, and very easy to get along with. Despite English proficiency being widespread across the locals, before getting there I tried to learn how to say the basics in Swedish (hi, thank you, cheers, etc. ), and just like most places I’ve visited so far, people appreciated my efforts. Given my non-dev background, I mostly attended the business/entrepreneurship track in the secondary room, where I also spoke. I really liked that several talks (even some from Swedish speakers) were in English, first of all because I could understand them, secondly because it tells me the Swedish community aims to share their expertise to the whole world. There were talks in Swedish too though. From this point of view, I’d say the event was well balanced, though the vast majority of the attendees were locals. I’m all in for local languages and cultural diversity, but at the same time I appreciate the effort to engage with foreign attendees and reach out to the world through WordPress.tv. My favourite talks were “High Converting Websites and Pages—What Do They Have In Common?” by Erik Bernskiold and “Open Source Entrepreneurship” by Jimmy Rosén. Erik’s talk gave a comprehensive list of features that a high-converting web page needs to have, including some really interesting concepts from a number of fields—from behavioural economics to web design. Jimmy shared his take on how to thrive in the web industry, future-proof your business and ultimately have the resources to give back to the open source community. I’ve spoken about the importance of the co-working culture, which these days is getting more and more popular. Co-working spaces are growing pretty much everywhere in the world, and I strongly believe that we, as WordPress professionals and part of this wonderful community, are well suited to play a major role in their boom. My talk was well attended (the room was fully seated) and well received. You can find the slides here. I had two questions on the stage, both of them involving the challenges that remote working adds to everyday’s work flow at Human Made. The event was hosted at the Norrköping Visualiseringscenter, a research and science centre featuring media labs, interactive exhibitions and an immersive 3D dome theatre that hosted the dev track. The dome itself was just… awesome. It somehow reminded me of the Greenwich planetarium, but more conference-friendly. Finally, a quick mention about the fika. Fika is the Swedish word for coffee break. But there’s more to that. When you do the fika, you don’t just get your cup of joe then go back to your desk: fika is a Swedish cultural institution that recognises the need for a coffee break during your busy day. You can spend the fika either chatting with people you may or may not know, or just staying on your own and enjoying a moment of serenity. I like that the WordCamp schedule had Morning Fika / Afternoon Fika instead of the more common coffee break. They must be quite proud of their fika—Sweden is also the third country in the world for per-capita coffee consumption, and that surely means something. The local WordPress agency and rigorously shoe-free environment Angry Creative hosted the contribution day. Several groups were arranged, including core contributors, theme reviewers and translators. The atmosphere was quite relaxed but very productive, with a pizza lunch and an afternoon ping-pong break. The Contribution Day epic lunch break. Photo by Jimmy Rosén. Both the speaker / organiser / sponsor dinner and the after party were hosted at Enoteket, an Italian restaurant with wine on tap, authentic Italian pizzas and Francesco Totti & AS Roma memorabilia on the wall. For someone like me, who spent a substantial part of his life in Rome, that was quite weird indeed! 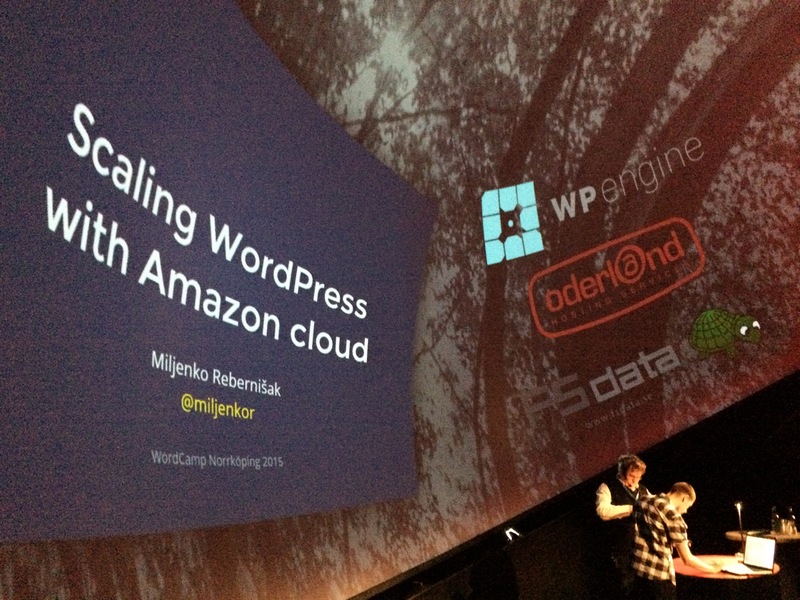 I’m sure the 2015 edition of WordCamp Norrköping has represented an important milestone for the Swedish WordPress community. Sweden already hosted a number of WordCamps in the past. The local community is growing. There are a few new meetups and user groups showing up around the country. I met someone who is setting up a co-working space. I could feel the enthusiasm across attendees, speakers and organisers, and I truly hope it lasts. Events like WordCamps are excellent when it comes to inspiring and pushing people to do the right things, but what’s important is that the community keeps that flame alive. I’m 100% optimistic about this. I hope to be back next year, and I hope to see more foreigners travelling to Norrköping for the WordCamp. Getting there is easy and convenient (the closest airport is Stockholm’s low-cost hub Skavsta), staying is cheap (the Cloud Hostel has hostel prices and hotel-worthy rooms), eating is even cheaper (I had full meals for less than £8, with complimentary coffee at the end! ), and language barriers are basically non-existent.